Today, virtual reality (VR) applications are a common sight in many areas of construction design, for example to view a virtual simulation of an industrial facility before it is made. With its VR Inspection application, PITERION is enabling users to perform actions directly within the virtual reality environment by allowing them to create change specifications at the relevant position in the design. Now, for the first time, it is possible to send feedback to the connected product data management system, where the results of the work carried out in the virtual reality environment are saved in the correct place. The intuitive, easy-to-use system allows even non-experts or subsequent users to become involved in projects at an early stage. VR applications enable a realistic picture of a future structure or environment – for instance a laboratory, industrial facility, or part of a building – to be generated as early as the design phase. A number of corresponding solutions are already available, but up to now these have been limited to purely viewing and examining a design, and any modifications – for example a suggested change in a component’s position – have to be recorded or submitted elsewhere. Not only does this involve a certain amount of effort, but it also creates additional work later on, for example during test runs with potential subsequent users who have no design expertise. In 2018, PITERION started offering VR Inspection, the first VR application for design and development that not only displays the current status of all CAD data at the touch of a button, but also has a feedback channel back to the source system. Users can enter instructions for changes and corrections using a number of English voice commands while inspecting the virtual reality environment. Because VR Inspection is linked to the corresponding PLM system, this information is transferred to the responsible designers, who then see these instructions in the relevant position in the model. The application hardware is provided by the product 3D ViewStation from visualization specialists Kisters. Based in Aachen, Germany, Kisters has been an established partner in PITERION’s partner portfolio for many years. 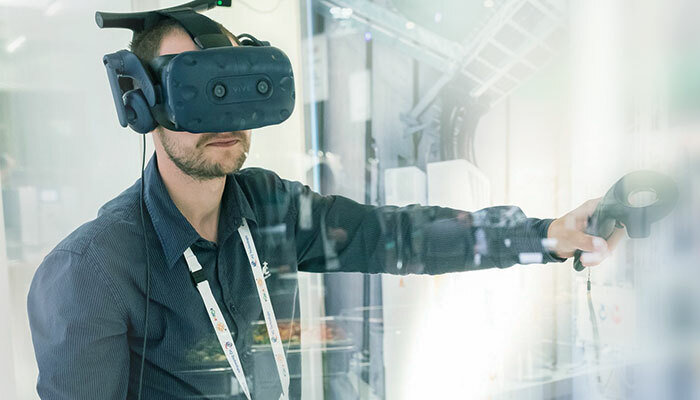 By enabling both experts and non-experts to create change specifications in a virtual environment, VR Inspection helps to improve the functionality and compatibility of an object at a later stage. It provides designers, developers, or potential users with an accurate tool to put forward their own modification suggestions and, for example, to make a future environment or facility even more practical or ergonomic. The solution can also be used for mandatory inspections: with VR Inspection, assessors can examine and evaluate a facility in a virtual environment in advance; any components that block an escape route, for example, can therefore be highlighted at an early stage. Recording and forwarding change specifications in this way also makes misunderstandings or information loss less likely, and it allows several or more intensive inspection cycles to be carried out if necessary. Furthermore, with these features, VR Inspection supports an agile design process. PITERION’s customers also benefit from having a partner who knows exactly what is required to integrate the application seamlessly into the company environment. Further areas of application have already been identified, and there are plans to upgrade VR Inspection by the end of 2019 so that it can be used in existing facilities. By collecting live data on-site, it will be possible to view the current condition of components such as motors or control units in real time using a digital twin. This will make it easier to coordinate maintenance and service work. PITERION is an international PLM service provider headquartered in Germany with branches in the USA, India, Singapore, Tunisia, Sweden, Switzerland and Poland. Our highly qualified staff offers solutions and services independent of system manufacturers. We always follow the provisions of the EN 9100 (aerospace), ISO 9001 and ISO 14001 quality management standards. We have set up internal standards and processes that enable us to maintain a consistently high quality of service across our sites throughout the world. We constitute a competent and independent partner of our customers providing tailor-made solutions and services. Jointly with our technology providers we may therefore support the PLM strategy of our customers in the best way possible.